Massage for gout relief is attractive, but complicated. Massage is attractive as a gout relief method that avoids medication. Many gout sufferers seek relief from gout pain, but don’t want to rely on medicines. Massage is more complex than simply rubbing the affected area. In this article, I will explain different types of massage, and which is safe for gout. After reading Massage for Gout Relief, you will understand which types of massage are safe for gout, which types of massage to avoid, and where to get more help about gout relief that does not use medicine. Massaging sore joints seems to provide relief for many gout sufferers. Against this, most qualified massage professionals advise against massaging areas affected by inflammation. So is gout massage a good idea? Massage therapy is very helpful in the management of gout by promoting blood circulation to the affected area and thereby reducing inflammation and swelling. I expressed my safety concerns to him, and asked if massage does help gout. His detailed response made me realize that massage is good for gout if it is applied in the right way. Massage therapy involves rubbing of the superficial and deep tissue. Gout symptoms are presented as severe symptoms during active inflammation of the joint, or mild to moderate symptoms when inflammation is subsided following taking medication. Massage therapy suggested is superficial massage therapy mostly applied to the soft tissue around the inflammatory joint so blood circulations are improved. The reason behind the massage therapy and improvement of the circulation is to promote the absorption of uric acid deposits around the joint. Inflammation is caused by uric acid deposits. Massage should be done by an experienced massage therapist to prevent deep massage of the joint in gout patient. Alternatively, individuals who may understand the anatomy of surrounding soft tissue could try superficial massage therapy after a few sessions with an experienced massage therapist. Superficial massage of areas affected by gout should relieve symptoms. Deep tissue massage of areas affected by gout should be avoided. Detailed investigation of massage techniques is beyond the scope of GoutPal. However I have had a brief look at studies of massage and they appear to confirm benefits of massage for inflamed tissues. Generally speaking, it looks like massage for gout relief is a good thing. However, you need to be careful. I agree with Dr Kerkar, and I recommend a few sessions with an experienced massage therapist before you start applying gout massage yourself. 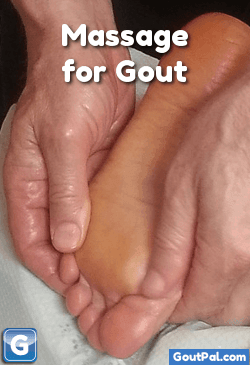 If you want more information about gout relief that does not involve medicine, please see my Gout Relief Guidelines, linked at the end of this massage guideline. But what if you want more help with massage for gout relief? I recommend talking to your doctor about gout massage therapy, or any other aspect of gout treatment that you are not happy about. But maybe you are unsure what to ask, or you’ve tried it, but didn’t understand the answers. That’s why I supply personal help with all my gout guidelines. Gout treatment is a personal matter, and I want you to be clear about massage for Your gout relief. If you prefer to read more gout facts, please browse my Gout Treatment guideline, or look for more non-medical gout treatments in my Gout Relief Guidelines. Leave Massage for Gout Relief to browse Gout Relief Guidelines.